New Orleans, LA. (April 24, 2018) - The Native American Finance Officers Association (NAFOA) hosted its 11th Annual Leadership Awards Luncheon during its 36th Annual Conference at the Roosevelt Hotel New Orleans. 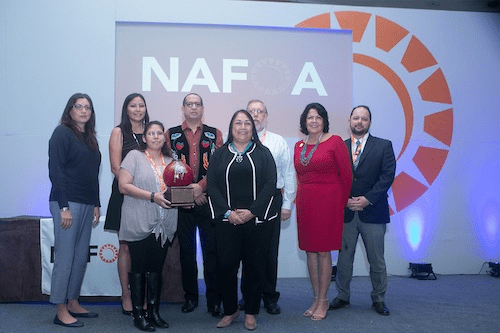 In front of a record-breaking audience, NAFOA honored the accomplishments of a tribal leader, tribal executive, financial deal advancing tribal economies and an education program positively impacting Native Americans. John L. Berrey, Chairman of the Quapaw Tribe of Oklahoma is the distinguished recipient of NAFOA Tribal Leader of the Year Award. Shane Jett, CEO of the Citizen Potawatomi Community Development Corporation was honored as the Executive of the Year. NAFOA recognized the St. Croix Chippewa Indians of Wisconsin with the Deal of the Year Award. The Education Program of the Year was awarded to the Pechanga Financial Education Online Course for Youth. “This year’s honorees include extraordinary people, a cutting-edge education program, and an innovative financial deal nominated by the NAFOA community for their outstanding accomplishments and contributions to Indian Country. The NAFOA Board is humbled and honored to recognize and celebrate them on behalf of the NAFOA community,” remarked NAFOA’s 1st Vice President, VaRene Martin. During Chairman Berrey’s tenure on the Quapaw business committee and as tribal chairman, the Quapaw Tribe experienced exponential growth in its enterprises and services. Most recently Chairman Berrey has become nationally recognized for his leadership and vision in tribal agricultural production that promotes food sovereignty and environmental stewardship. In addition to the successful Downstream Casino, the Quapaw Tribe also operates the Quapaw Cattle Company, Quapaw Processing Plant, Quapaw Honey, O-Gah-Pah Coffee, and O-Gah-Pah Bison. The Quapaw’s agricultural businesses and programs represent innovation and creativity that enables farm to table supply services for their casino, provides quality local jobs, and offers more nutritional food options to their local community. Chairman Berrey is a member of both the Quapaw Tribe and Osage Nation and was born in Denver, Colorado. He credits his grandmother for ensuring he had a strong foundation rooted in his Native culture and religion. Chairman Berrey graduated from the University of Arkansas with a Bachelor of Science in Journalism in 1991. He is a fourth-generation rancher and father of two children. NAFOA is pleased to announce that Shane Jett is the recipient of the 2018 Executive of the Year award. Jett is the CEO of the Citizen Potawatomi Community Development Corporation (CPCDC), the largest native owned financial institution of its kind. When Jett began as the CEO in 2011, CPCDC’s revolving loan fund had $14 million under management and was the second largest native-owned Community Development Financial Institution (CDFI) in the United States. Today, the CPCDC is undisputedly the largest native-owned, non-bank CDFI in the United States with over $65 million under management. During his seven-year tenure as CEO Jett has championed a “whole-person approach” which has both empowered his team and led to substantial financial success. In 2016, his team brought $47 million in new money to CPCDC which was more than all the combined funds raised since inception in 2003. They alone, out of 70 Native CDFIs, were included in the United States Treasury Guarantee Bond Program, securing an allocation of $16 million. [M1] The CPCDC concluded the year with another $25 million in funding from USDA’s Rural Development Community Facilities Relending Program. Jett is known to invest in and expand opportunities for his employees. Upon learning members of his team at CPCDC had unfinished college degrees, he redirected his professional development training budget toward college tuition. Today, all staff at CPCDC either have completed or are on track to complete college degrees. NAFOA awarded the St. Croix Chippewa Indians of Wisconsin with the 2018 Deal of the Year Award for the innovative usage of financing combined with the New Markets Tax Credit (NMTC) program. This complex deal was years in the making. It provides refinancing of existing gaming debt, loans for new economic development project construction, obtaining NMTCs for the repurposing of the existing judicial building, and the development of a new judicial center. The St. Croix Chippewa Indians of Wisconsin used NMTCs with the financing for the economic development projects, producing a net $4.5 million of cash to fund the new judicial center in its entirety. This deal provides a great model for tribes to leverage their funding for economic development projects and pair it with NMTCs to fund non-revenue producing governmental buildings. The existing debt refinancing lowers the tribe’s interest rates significantly and reduces its debt service payments. The new financing and NMTC funding allowed the tribe to continue expanding its economic enterprises and provides over 90 new jobs. NAFOA congratulates the St. Croix Chippewa Indians of Wisconsin. The Pechanga Financial Education Online Course for Youth is the 2018 recipient of the Education Program of the Year Award for bridging an achievement gap impacting their youth. Recognizing that California was not adequately implementing financial education in their public schools, Pechanga launched an online course in June of 2017. Their curriculum is designed to empower and improve the financial health of their young tribal members. Pechanga consulted with many stakeholders in developing the program including the Pechanga Youth Council, and financial leaders across Indian Country to determine key financial topics of concern. The course includes a series of 2-4 minute videos and short quizzes covering basic financial concepts like budgeting and banking, as well as native specific topics like per-capita payments and the General Welfare Exclusion Act benefits. In its first year, 100% of Pechanga high school seniors turning 18 completed the course. Early indicators show that the program has been effective in improving understanding of financial concepts. Students taking a pre- and post-course assessment saw an average increase of 38% from 57.7% to 95.7%. NAFOA is proud to recognize The Pechanga Band of Luiseño Indians’ Financial Education Online Course for Youth for its outstanding work in improving the financial well-being of Native American youth. NAFOA is a national non-profit organization whose mission is to strengthen tribal economies by promoting excellence in financial management, advocating sound economic and fiscal policy, developing innovative education initiatives, and providing essential information, resources, and support to meet the challenges of economic growth and change. NAFOA will be holding its 2018 Fall Finance and Tribal Economies Conference at the Hyatt Regency Tamaya in Santa Ana Pueblo, New Mexico on October 1-2, 2018.